ebookers.com is a leading pan-European online travel agency specialising in worldwide travel. 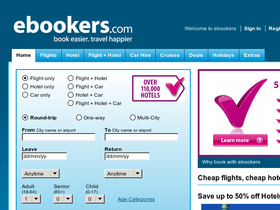 ebookers.com offers a wide range of travel products including a choice of over 250 airlines, more than 86,000 hotels, holidays, car hire and insurance. eBookers is designed to accommodate needs for the frequent traveler, business traveler and personal traveller. Check VoucherGurus.co.uk for all the latest travel eBookers promos, eBookers vouchers and eBookers vouchers for online savings. Visit EBookers.com and you'll find worldwide cruises discounted 15% on beautiful, sought after destinations with the best Cruiselines in the business.